Astronomers have photographed first direct image of a planet in the process of forming around its star. What astronomers are calling LkCa 15 b, looks like a hot "protoplanet" surrounded by a swath of cooler dust and gas, which is falling into the still-forming planet. 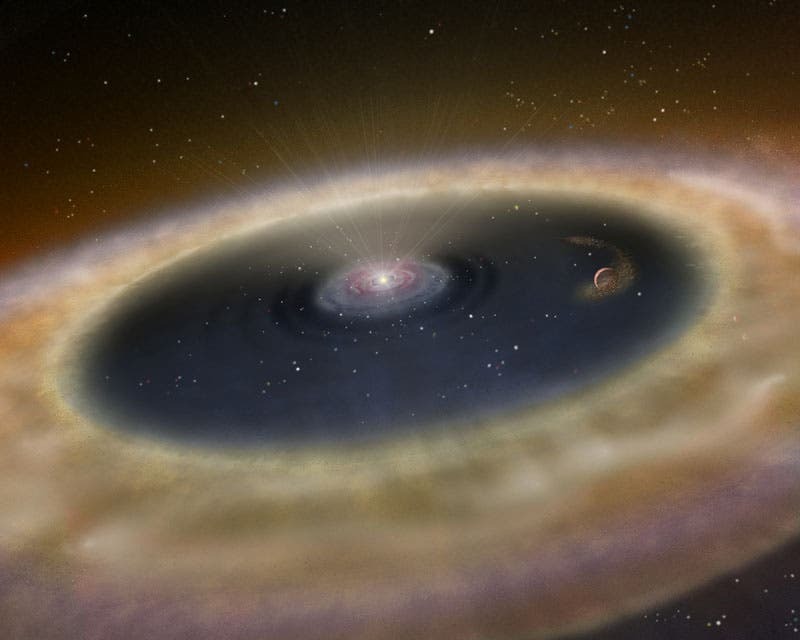 Images have revealed that the forming planet sits inside a wide gap between the young parent star and an outer disk of dust. Adam Kraus of the University of Hawaii Institute for Astronomy and colleague Michael Ireland of Macquarie University and the Australian Astronomical Observatory combined the power of the 10-meter Keck telescopes with a bit of optical sleight of hand. "LkCa 15 b is the youngest planet ever found, about 5 times younger than the previous record holder," said Kraus. 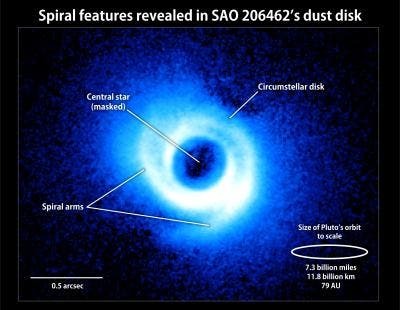 "This young gas giant is being built out of the dust and gas. In the past, you couldn't measure this kind of phenomenon because it's happening so close to the star. But, for the first time, we've been able to directly measure the planet itself as well as the dusty matter around it." The optical sleight of hand used by the astronomers is to combine the power of Keck's Adaptive Optics with a technique called aperture mask interferometry. The former is the use of a deformable mirror to rapidly correct for atmospheric distortions of starlight. The latter involves placing a small mask with several holes in the path of the light collected and concentrated by a giant telescope. With that, the scientists can manipulate the light waves. "It's like we have an array of small mirrors," said Kraus. "We can manipulate the light and cancel out distortions." The technique allows the astronomers to cancel out the bright light of stars. They can then resolve disks of dust around stars and see gaps in the dusty layers where protoplanets may be hiding. "Interferometry has actually been around since the 1800s, but through the use of adaptive optics has only been able to reach nearby young suns for about the last 7 years." said Dr. Ireland. "Since then we've been trying to push the technique to its limits using the biggest telescopes in the world, especially Keck." The discovery of LkCa 15 b began as a survey of 150 young dusty stars in star-forming regions. That led to the more concentrated study of a dozen stars. "LkCa 15 was only our second target, and we immediately knew we were seeing something new," said Kraus. "We could see a faint point source near the star, so thinking it might be a Jupiter-like planet we went back a year later to get more data." In further investigations at varying wavelengths, the astronomers were intrigued to discover that the phenomenon was more complex than a single companion object. "We realized we had uncovered a super Jupiter-sized gas planet, but that we could also measure the dust and gas surrounding it. We'd found a planet at its very beginning" said Kraus. Drs. Kraus and Ireland plan to continue their observations of LkCa 15 and other nearby young stars in their efforts to construct a clearer picture of how planets and solar systems form. In a new discovery elsewhere, the image shown below of the disk of gas and dust around a sun-like star is the first to show spiral-arm-like structures. These features may provide clues to the presence of embedded but as-yet-unseen planets. "Detailed computer simulations have shown us that the gravitational pull of a planet inside a circumstellar disk can perturb gas and dust, creating spiral arms. Now, for the first time, we're seeing these dynamical features," said Carol Grady, an astronomer with Eureka Scientific, Inc., who is based at NASA's Goddard Space Flight Center in Greenbelt, Md. She revealed the image today at the Signposts of Planets meeting hosted this week at the center. Grady's research is part of the Strategic Exploration of Exoplanets and Disks with Subaru (SEEDS), a five-year-long near-infrared study of young stars and their surrounding dust disks using the Subaru Telescope atop Mauna Kea in Hawaii. The international consortium of researchers now includes more than 100 scientists at 25 institutions. "What we're finding is that once these systems reach ages of a few million years, their disks begin to show a wealth of structure — rings, divots, gaps and now spiral features," said John Wisniewski, a collaborator at the University of Washington in Seattle. "Many of these structures could be caused by planets within the disks." The newly imaged disk surrounds SAO 206462, an 8.7-magnitude star located about 456 light-years away in the constellation Lupus. Astronomers estimate that the system is only about 9 million years old. The gas-rich disk spans some 14 billion miles, which is more than twice the size of Pluto's orbit in our own solar system. The Subaru near-infrared image reveals a pair of spiral features arcing along the outer disk. Theoretical models show that a single embedded planet may produce a spiral arm on each side of a disk. The structures around SAO 206462 do not form a matched pair, suggesting the presence of two unseen worlds, one for each arm. However, the research team cautions that processes unrelated to planets may give rise to these structures. The view was made possible by the High Contrast Instrument for the Subaru Next Generation Adaptive Optics, or (HiCIAO, pronounced "HI-chow"), which is designed to block out harsh direct starlight. Image below: Two spiral arms emerge from the gas-rich disk around SAO 206462, a young star in the constellation Lupus. This image, acquired by the Subaru Telescope and its HiCIAO instrument, is the first to show spiral arms in a circumstellar disk. The disk itself is some 14 billion miles across, or about twice the size of Pluto's orbit in our own solar system. The paper is available at http://arxiv.org/abs/1110.3808.